We got a little late because we had to check out of our hotel this third day being our last of the tour. Our bus was underway around 7am. This morning we were served breakfast at the hotel. 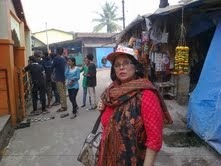 Vighneshwar Temple: Our seventh temple of the Ashtavinayaka tour was the Vighneshwar Temple at Ozhar. It is situated on the banks of Kukadi River, 95 km away from Pune city, just off the Pune-Nashik Highway, in the Junnar taluka of Pune district. The temple is enclosed on all sides by high stone walls, and its pinnacle is made of gold. The Ganesha form worshipped here is called Vighneshwar, ‘Lord of obstacles") or Vighnahar (spelt also as Vignahara, "Remover of obstacles") and is associated with the legend of Ganesha defeating Vignasura, the demon of obstacles. The temple is surrounded by a walled compound with a large gateway flanked by two large stone Dvarapala (gatekeepers) sculptures and a row of four musicians in bas relief on the lintel. One can view the Lenyadri shrine and Shivneri Fort standing on the wall. Two large stone Deepamalas (lamp towers) stand near the gateway in front of a fine corridor of seven cusped arches. There are owaris (small room for meditation) on both sides of the gateway. The courtyard is tiled. The central temple has three entrances with sculptured side posts and lintels; the east one being the central one. The central one has a lintel with a Ganesha in relief surrounded with monkeys and parrots on trees. 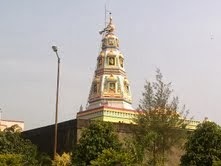 The temple has two halls, with first one (20 feet high) having the entrances to the north and south too and has the image of Dhundiraj Ganesha. The next one (10 feet high) has a white marble mushika (the mouse, which is the vehicle of Ganesha) seating in attendance. The temple walls are filled with murals and colorful sculptures. The shikhara - over the sanctum - is covered with gold foil. 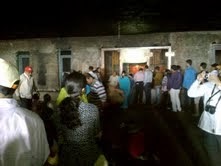 It also has two wide stone Prakarams (outer path outside a Hindu sanctum). Ozhar is prescribed as the seventh temple to be visited in the Ashtavinayaka circuit, though pilgrims often visit Ozar fifth, as it is a more convenient route. However, we have visited this as our seventh destination only. 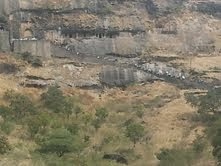 Girijatmaj Temple: Our eight and last temple of the tour was the spectacular mountain cave temple, Girijatmaj, at Lenyadri ('Lena' in Marathi meaning "cave" and 'adri' in Sanskrit meaning "mountain" or "stone") very near to Ozhar. The temple is situated within a series of 30 rock-cut Buddhist caves on a mountain, which are also called Ganesha Caves—the seventh cave housing the Ganesha temple. The temple hall with the altar has around 18 rock-cut cells used as meditation rooms. Situated 97 km from Pune, you have to climb 307 steps to reach the temple. The idol here is not a separate idol but has been carved on a stone wall of the cave, from which only one eye of the idol can be seen. 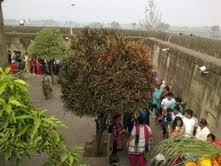 The mountain temple campus are full of monkeys who mix well with the devotees and accept the food offered. ‘Girijatmaj’ literally means Ganesha the son, atmaj meaning son and Girija another name of Goddess Parvati or Goddess Durga. Legends have it that desiring to have a son; Parvati underwent austerities meditating on Ganesha, for twelve years at Lenyadri. Pleased by her penance, Ganesha blessed her with the boon that he will be born as her son. Accordingly, on the fourth lunar day of the bright fortnight of the Hindu month Bhadrapada (Ganesh chaturthi day), Parvati worshipped a clay image of Ganesha, which came alive. Thus, Ganesha was born to Parvati at Lenyadri. Later, he was named Gunesha by Lord Shiva. Shiva gave him a boon that whosoever remembers him before starting a job, will successfully complete that task. For 15 years Gunesha grew up at Lenyadri. Sindhu, who knew that his death would be at the hands of Gunesha, sent demons like Krur, Balasur, Vyomasur, Kshemma, Kushal, and many more, to kill Gunesha, but all of them were instead killed by him. At the age of six, the architect-god Vishwakarma worshipped Gunesha and endowed him with the weapons of Pasha (noose), Parashu (axe), Ankusha (hook) and Padma (Lotus). Once, little Gunesha knocked an egg from a mango tree, from which emerged a peacock. Gunesha mounted the peacock and assumed the name Mayureshwara. Mayureshwara later killed Sindhu and his army-generals at Morgaon, the most important Ashtavinayaka temple. Twenty-six of the caves are individually numbered. The caves face to the south and are numbered serially from east to west. 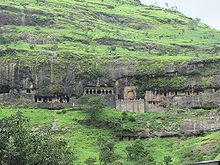 Caves 6 and 14 are chaitya-grihas (chapels), while the rest are viharas (dwellings for monks). The latter are in the form of dwellings and cells. There are also several rock-cut water cisterns; two of them have inscriptions. The layout of the caves, in general, is similar in pattern and shape. They mostly have one or two sides with two long benches for occupants' use. 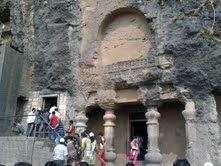 The caves date from between the 1st and 3rd century AD; the Ganesha shrine situated in Cave 7 is dated to the 1st century AD, though the date of conversion to a Hindu shrine is unknown. All of the caves arise from Hinayana Buddhism. —inspired by the Republic Day being observed on 26TH January, 2014 today. The young helped the older and waited for them to get their breath back now then on the way up. Ashtavinayaka tour has been quite hectic but very fulfilling for us. Taking three days off during a continuously busy schedule we planned our very first Ashtavinayaka trip and completed the full darshan thanks to the blessings of Lord Ganesha. Religious beliefs and sentiments would naturally vary from individual to individual, but you do not need to be bound by a particular religion to visit such wonderfully vibrant ancient sites. Like the way cosmopolitan Mumbai celebrates Ganesha Festival every year. We were given lunch at a nearby hotel. 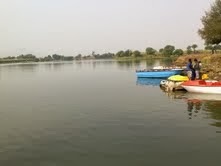 For the first time during this hectic tour people were seen taking their time and relaxing a lot. The bus dropped us back in Mumbai around 8 pm. 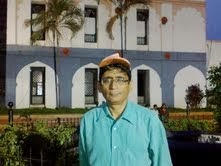 I've always been fond to visit pilgrimages places wherever they are and also I go with my all friends to visit there. Next, we are planning to visit vaishno devi, where I never visit ever. Girijatmaj temple would be my favourites. Thanks for guide!! Great yatra share with good images. its use full for me thank's.